As one who loves Apollon, Leto has an important place my in home. I am not sure how much worship she gets in modern Hellenismos. It is clear that she had a significant following historically. 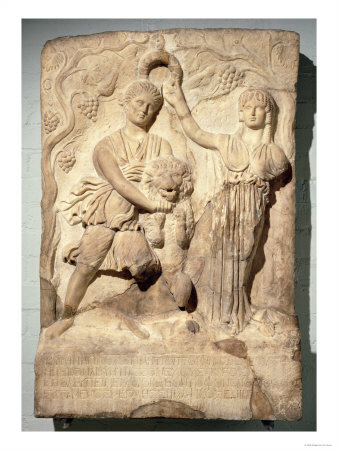 It is pretty clear though that her worship was inseperable from that of Apollon and Artemis as she is typically depicted in the company of her children, and in one case from Lydia she was represented too with the nymph Ortygia. Her accompanying role to her children in much of Hellas is contrasted by Lycia where her cult may have had a stronger position than in many other places, as her name seems to have translated into meaning “woman”, infering that Leto may have been considered a goddess of prominence. However, the alternate translation of her name (“Unobserved”) is also revealing and not unassociated with her role in Lycia and other parts of Ionia as a goddess associated strongly with the underworld. This name suggests a hidden nature of the titanide. As the sister of Asteria, it is quite possible that there may have been some contrast between the bright Asteria, and her darker hidden sister Leto, both of whom were desired by Zeus..one who married him and the other who fled into the sea to escape him and became the island Delos. Such darkness may very well aligned Leto both the underworld and to the dark envelope of night from which light is born. It seems as a matter of coincidence that Leto was said to come from Hyperborea, a land beyond the furthest north (which is in itself connected to long seasons of darkness). In such respects we can, for the purpose of reconstructing her worship, can probably infer some commonalities between Leto and Persephone, or her neice Hekate. Indeed if we consider for a moment the role that Zeus takes as Chthonic god as her position as one of his earlier “wives” (for which the suggestion on theoi.com that her name Unobservable or To Move Unseen, we may regard this to refer to modesty that is associated with the lives of married women), there may be some early parallel to Hades and Persephone. In the Theogony Leto is specifically addressed as a goddess who is always mild and kind to the deathless gods, which implies to me that she is of such character as one would expect of a hidden underworld goddess…one who is kindly by nature as would be a goddess who receives the dead. Of course that she is poetically often described as being present on Olympos, particularly in the poem of Hesiod in the Homeric Hymn to Apollon, this only seems to imply a retention of her power and esteemed position, as she is the one who receives the bow of her son and unstrings it. She is the receiver and bearer of light. In this fashion I imagine Leto as a beautiful woman, garbed in black or gray, with a sympathetic and kind face. An obscure goddess illuminated only by the presence of her children in whose company she delights. For she never appears where they are not. In the Iliad she is inseperable for the side of Artemis. Actually when it comes to the Iliad I think we can learn something from the manner in which the gods are paired in the war of the gods that reveal something. Some gods we see nothing if (such as Demeter and Hestia…Hestia perhaps because she never leaves the hearth of Olympos, and Demeter perhaps because she is unaffiliated in such concerns). The lot of gods in whom they are combating is certain quite purposeful. Apollon and Poseidon (whom Homer reminds us worked cooperatively before in Ilium) and have associations with the traversing of the sea and harbors are matched against each other in the quarell. Athena takes part against Ares, both gods who are esteemed in the art of war. Hera and Artemis are set against each other in which we have the queen of gods and men being challenged by a goddess who is often called queen in her own right and is ascribed as the daughter of Hera by the Thracians. Hephaistos’ fire is countered by the streams of Xanthus. And Leto is set against Hermes, a god whose functions lay in the traversing between the world of the living, that abode of the gods, and the underworld. So for me this pairing is rather significant, even as it is amusing by the fashion in which Hermes yeilds the contest to Leto refusing to raise hand against her. I also find it curious that in the relating of the gods (with the exception of Athena and Zeus) fled into Egypt from Typhon, that Leto become a shrew-mouse. Interesting the mouse and the mongoose snake (the mouse representing night and the snake representing day) were both directly associated with the Egyptian Wadjet who was revered as a goddess of childbirth, protector of children, a goddess associated with justice, and eventually considered the protector of kings. She is also a nurturing goddess as the one who helped Isis nurse Horus, and was associated with plant growth–specifically the papyrus. For a general overview on Wadjet you may wish to read further here. If we consider that there was some alignment in Hellenic thought between Leto and Wadjet we are seeing a goddess associated with divine rulership, law, death, and growth…all of which is compatable with my vision of Leto, and my theories on the relationship between Leto and Themis who bore such similar sons, and the latter who nursed the son of Leto on ambrosia. The early association between Wadjet and Isis just makes it all the more convenient too. Yet among the birds Leto is strongly associated with the stork, as we understand from Aristophanes’ Birds. It is a mute bird, clattering their beaks for communication rather than any kind of song. The clattering sound is rather eerie from what I have heard in their nesting grounds when I visisted Morocco, like some primitive primal noise that rises on the air and makes the hairs on your arm raise ever slightly. And like the swans associated with Apollon, the stork is also attached to its mate (and to its nest for that matter). To back up whatever chthonic nature Leto has, the stork has been associated with bearing wealth (which reminds us of Plutus) by some Germanic peoples, and with the underworld by Estonians, and in Baltic mythology has been associated with killing insects and reptiles. 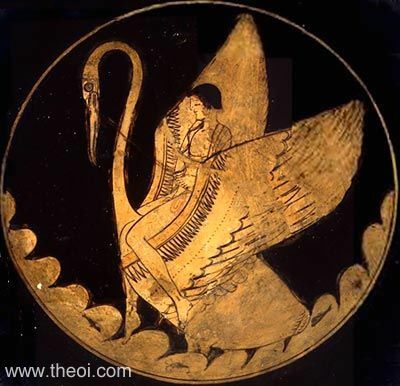 Of course sacred birds make an interesting mix as the swan is also associated with Ares and Zeus, so too is the stork also associated with Hera. Overall the stork is representative typically of nurturing parenting that tends to be common of earthly goddesses. Largely because of space issues (I just haven’t had that many shelves and available table tops) Apollon and Artemis have been sharing shrine space in one united shrine. On many occassions it works out quite well because I can make prayers and libations to both together, and it feels tied togethr with the representation of Leto there too. It just seems so very *right* sometimes and quite convenient for when I wish to pray to the family so to speak. But over time it has been gradually trickling into my brain that I pray to, and give libations to, Apollon alot more than Artemis, and it just seems to be awkward…like maybe I am ignoring Artemis who is right there beside him. I know in reality it is a non-issue. I seriously doubt the gods care even the tiniest bit. But it just seems to me that if I am going to spend more time addressing them seperaely than I am praying to them together, perhaps it would be a good idea then to move Artemis to the shelf just below Apollon’s (and adjust the placement of other statues accordingly). Therefore it would possible to pray to them together as part of a single shrine, and yet being on two seperate shelves they will be seperate shrines too. Seperating the shrine would be little work. Leto would naturally go on Artemis’ shrine largely because Leto is often depicted as being a companion to her daughter Artemis more commonly than she is shown with Apollon. Everything else is pretty much already divided out on their perspective sides so it would just be a matter of moving Artemis’ side downward. This will in no means reduce the worship to Artemis, but will rather just give her own seperate area of worship as she had before.